I feel like I'm just posting breakfast recipes at the moment - that will change soon though, I promise! Have no fear, I've got a couple of kitchen experiments in mind so stay tuned for how those turn out. Anyway, this week's recipe is for vanilla protein waffles, a delicious vegan and gluten-free breakfast that not only tastes good but is super nutritious and full of ingredients that will give you energy all morning. 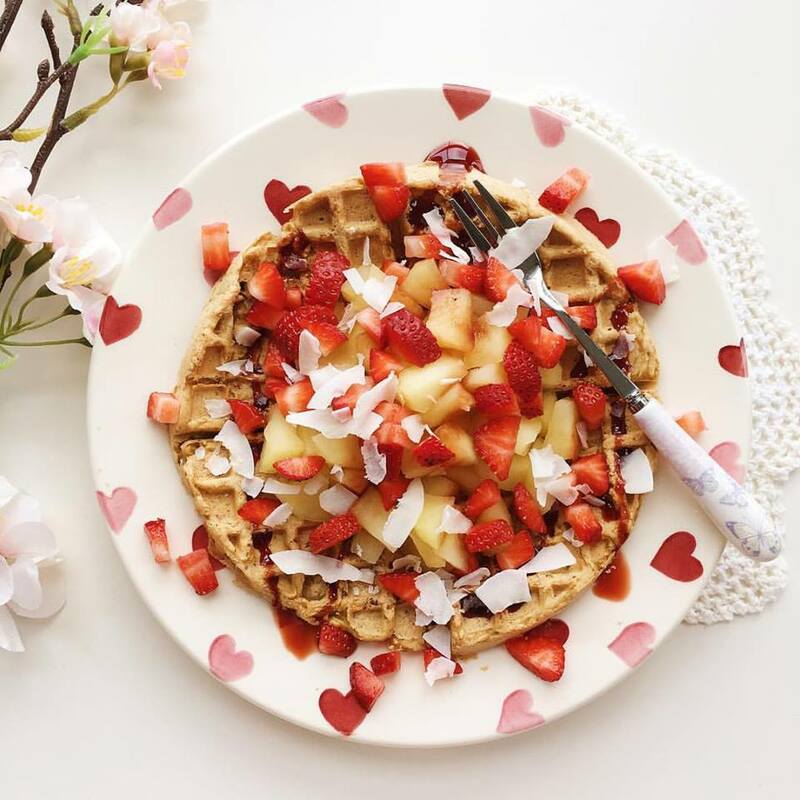 I usually have my waffles served with lots of berries, nut butter and syrup (maple, rice or date syrup are the best - leave the bees alone and avoid honey!) but yesterday I decided to go a bit crazy and have poached apple. The result? A plate of pure breakfast joy. Very sweet apples such as Pink Lady apples are best for this as you don't need to use any additional sweeteners. I'm a bit of a picky eater when it comes to apples and only ever have the Pink Lady variety anyway so I've always got a ridiculous amount of them lying around - poaching them to add to breakfast dishes is actually a great way to use them up! Of course you don't have to have the apple with your waffles if you're running a bit low on time or simply can't be bothered (this is usually the case for me) but it's highly recommended, trust me. After the apple chunks have been simmering for about 5 minutes, preheat your waffle maker - I have the No-Mess Waffle Maker from Sage and I use setting 2 which is the equivalent of 2 minutes preheating time and 2 minutes cooking time.